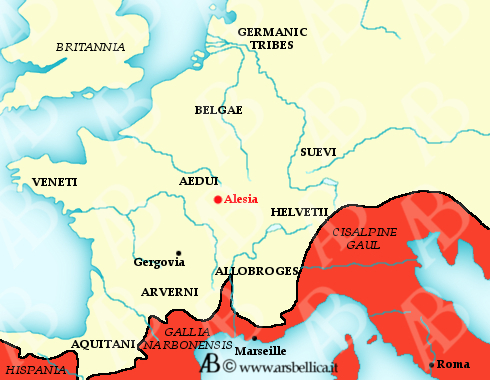 At the siege of Alesia, Vercingetorix's defeat causes the end of gaul civilization and began the establishment of the neo-Latin culture and Provencal French. What if Caesar had lost? Scion of famous and noble Roman family part of the gens Julia, which relates the descent from Aeneas, Caesar,however, could not count on a heritage that others from other families had; so he had to develop diplomatic-political "skills" to climb the cursus honorum albeit later than others. Early in his political career took the part of the popular ingratiating thus the Plebs in anti-Senatorial function, later given the situation of distrust between the Senate and Pompey, he joined the latter and Crassus to constitute the first tiumvirate that brought him the office of Consul and later quinquennial proconsulship of Gaul. His achievements in those lands, the following submission and the absolute fidelity of those peoples enabled caesar, when the Senate refused him the candidacy to the Consulate, to blow up a civil war in which the protagonists were him and Pompey. Caesar marched on Rome without encountering resistance, pursued and defeated Pompey to Greece (Pharsalus 46 BC) and, thereupon, gained the absolute control of Rome, where was appointed dictator for 10 years. His political vision then began to come out. His State project was a careful research of civil peace, voted to keep a relationship between Rome and the provinces and was oriented to obtain popular support. Even his not objective story of Gallic War (De Bello Gallico, in which is described the siege of Alesia between paragraphs 69 and 90 of the seventh book) had exclusively political reasons. As known Caesar had not everyone's approval for a lifetime, Senate and Republicans were still hostile to him. And it was a group of young Republicans, including his godson Brutus (hence the famous phrase Quoque you Brutus filii mihi! ), to assassinate him on 15 March 44 BC, without an alternative policy agenda to the one of the former dictator. Then, if after Caesar's death the situation of the Republic could be resurrected, what happened was the exact opposite. The sources we have, related to this Gallic leader, are exclusively linked to the story of Julius Caesar (De Bello Gallico). For sure we know that was leader of the Arverni tribe in the southern France. His prestige was founded on great courage (dowry request to all Gallic chiefs), to be originated from one of the ancient Celtic traditions people and to be the custodian of a famous Druid site (the Druids were the priests of the Celts), pilgrimage destination for the many Gallic tribes. Its origin and therefore the authenticity of his hatred versus the Romans, allowed Vercingetorix to succeeded where everybody before him had failed, unite under a single commander all peoples of Gaul. Caesar, from his point of view, says that Vercingetorix had managed this enterprise thanks to a series of threats and enticements, and a despotic authoritarianism. Vercingetorix was even able to defeat Caesar at Gergovia, but driven by internal policy needs, faced Caesar in open field and was rudely defeated and forced to retreat into the city of Alesia, where he was defeated again, and finally taken as a prisoner. As Plutarch tells us: he wore the coolest armour, armored the horse, and once released out the city's doors took a lap around Caesar waiting for him. Once dismounted and stripped of weapons remained quietly at his feet. Caesar bring him to Rome as an ornament of his victory, then made him kill (46 BC). The first appearance on the political scene of Caesar is due to the establishmente of the first triumvirate with Crassus and Pompey in 60 BC. Consul in 59 BC, obtained by the Senate the Government, for five years, of Cisalpine Gaul and Gallia Narbonnais (58-54 b.c. ), where, just arrived, began to act according to an old Roman tactic: protect the local population from his people enemies, causing them to become roman allies and laying the groundwork for a constitutional protectorate over the entire Gallic region (that was only a prelude to physical occupation of the Territories). In 54 BC, Caesar mandate in Gaul was over, but thanks to the cunning that characterized him was able to get form the Senate a renew of his mandate for other five years. This decision upset Vercingetorix king of the Averni tribe, that later, was indicated as the leader of the general uprising that will end the battle of Alesia. 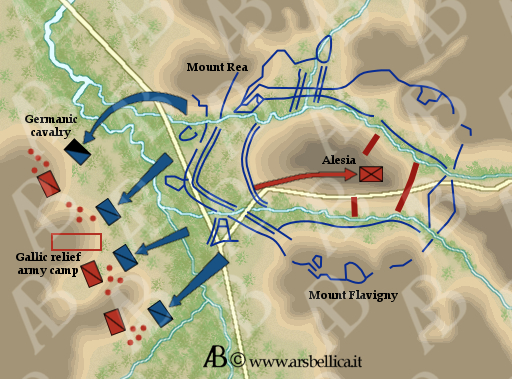 Before the battle of Alesia Vercingetorix had to face two problems of no small account. These were: the distrust of his own people and the Roman military superiority; his hope of tightening to all the gallic tribes could not be feasible if there wasn't at least some victory against the Romans on the table of the agreements, but, on the other hand, if it could not rely on trusted allies and on a much larger contingent, was difficult figure a victory against the Roman legions. So, for the first time in history, the guerrilla tactic was implemented. The purpose of Vercingetorix was burn out everything around the bulk of the Roman army, attacking the most isolated outposts or logistical columns in several parts of the country, far from each other, dividing the Roman forces and reducing their offensive power. In the meantime he could dedicate himself to raise new outbreaks of rebellion against Rome making new alliances between the Gallic tribes, consolidating his power. Finally, at the Congress of Bibracte, Vercingetorix was elected by the Ambassadors of gallic peoples as the Supreme Commander, but not yet ready to face the Romans in open field, dispatched three Corps of 10,000 men each against the same Roman province, hoping to bring the conflict to the borders of Italy or to even flinch Caesar southward (something that would give him time to get Allied troops from more distant regions of the country). Until the battle of Gergovia Caesar thought that outbreaks of rioting were part of simple seasonal uprising of the Gauls, to resolve in a short time and with little effort. For this reason he sent Labienus with four legions in the North against the Parisii, while he leaded six legions to South. But after the defeat at Gergovia and the revolt of the Aedui, Caesar himself realized that the situation was changed. He had three choices: first was to retreat south, towards the Roman region, leaving Labienus (being a protégé of Pompey, its abandonment could create repercussions on the image of Caesar in Rome); the second was to deal with the Gauls trying the corruption way (but this would earn only time for Vercingetorix); the last chance was to reunite with his Lieutenant and retreat immediately to the province hoping that the Gallic Commander, driven by enthusiasm, follow the Roman legions in order to discover in open field (and in a single battle) all gallic forces that with great effort he had built up over time. Vercingetorix fallen in the trap prepared by Caesar and, driven by his warriors euphoria, launched an attack against the Roman legions suffering a very heavy defeat. He retired and then fortified in Alesia where Caesar was determined to close the deal with the Gauls once and for all. When in 53 b.c. Vercingetorix, just in the middle of Gallic War, was bringing the rebel tribes, Caesar was still in Rome. Just informed about the beginning of the uprising, Caesar leave to Gaul with his legions. Arrived at Gergovia, the capital of the Averni tribe, Vercingetorix, with a furious surprising charge, forced the great Caesar to retire. It was the first defeat of Caesar in five years of war, and had to left on the field 46 Centurions and 800 Legionnaires. During the years in which took place the Gallic wars, military engineering was making great strides, changing trends and tactics of battles. War machines were now much more efficient. The Romans called them Tormenta, even if already used by Hellenic peoples, this machines were greatly improved and made even more powerful by the Romans. These machines could be used as a real artillery, not only for long range fire or protection to the infantry, but also in naval scenarios thanks to lighter equipment design (the so-called Scorpions). The war machines that were to be used by the army were built and operated from the cohortes fabrum, always coordianted with the rest of armies and Legionnaires. This cohortes were divided into: Ballistas, Catapults and Onagers, each of them able to throw sharp poles, stones or lead balls at a distance of 350 metres. The advent of war machines was not the only symbol of a changement brought by the Romans in the way of fighting in the Western world. In fact versus the granitic Greek phalanx (see Platea), excellent in wide spaces but limited in the small or hilly fields, the Romans opponed the more manoeuvrable and dynamic (given its divisibility) Legion, in its first form (with the "manipula" organization) as at the time of Caesar (Organization in cohorts). Over the years, the Roman army changed. In the 2nd century BC it was no longer composed of citizens who fighted for the fatherland when requested, but by professionals soldiers who were subject to an enrollment of sixteen years. This change was part of the ruin of the Republic, as troops tended to follow their dux, their commander, rather than obey to the will of the Senate, leading to civil wars like the one between Caesar and Pompey. On the other hand a professional army allowed to refine and specialize at maximum the figure of legionnaire who, until then, had been only a "part-time" fighter. The Legion was the basic unit of the Roman infantry. Divided into ten cohorts, each of which was formed by a variable number (depending on the era) of men, from a minimum of 3,000 to a maximum of 10,000, able to be divided into other subunits of different numerical consistency. These small units could act both autonomously and independently both deploy in a compact formation: the centuria. The centuria consisted of 60 infantrymen and 20 velites, the mainipolo, therefore, consisted of two centuries and the cohort was formed by three manipula, proving to be quite mobile units and laying the groundwork for the future armies division in battalions, companies and platoons. 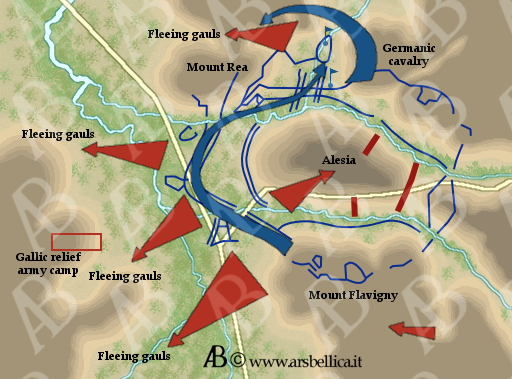 The situation that Caesar had to face at Alesia was undoubtedly one of the most dangerous in hisotry: besieging the Gauls, while being surrounded by another enemy army during the same siege. On the other hand, if the city of Alesia was well situated on a hill at 150 metres above sea level and bathed at the bottom by two rivers, was not large enough to accommodate the entire army of Vercingetorix, that was forced to build a ditch and an embankment around the same Alesia where hide. Caesar was well aware that it was not able to take Alesia with just one single attack, and decided to tighten the siege with a colossal work that allowed him to face simultaneous attacks by two armies overnumbering his forces. The first Caesar's order was to dig a huge ditch between the Hill of Alesia and the plain below, where any eventaul gallic attack at the construction of fortification would have been delayed. A hundred yards away was preparing two more large ditches by 4 feet deep and wide (the previous one was from 6 x 6), the most inside was filled by one of the rivers that course had been diverted, still behind this moat were constructed Palisades from three metres in height with parapets, and on the rest of the embankment there were pointed trunks facing the enemy. But it did not stop here, for every 25 metres of palisades Caesar order to erect towers with war machines on top, probably of catapults, then between the first ditch (the outermost one) and others, he built a series of antipersonnel traps: the first consisted of fifteen lines of pits with inside, embedded in the ground, trees with branches intertwined and biting (a kind of barbed wire) called "cippi" in front of these eight lines of sharp piles camouflaged and masked with bushes, called "gigli", finally a single line of pegs fitted with iron hooks called "stimulus". The construction of the wall at Alesia cost at the Romans more than a month of work in which Vercingetorix took the opportunity to send messengers throughout Gaul and gather an army of huge numerical proportions. To defend themselves from this impressive army, Caesar had order the building of the same kind of fortifications now facing towards the "outside" by enclosing its 7 camps (infantry and 3 Cavalry 4) with provisions for over a month and plenty of water thans to the diverted river. At the end of the works, the wall had a perimeter of 15 km, while the outer ring road stretched for 21 miles. At Alesia Caesar accused an abyssal outnumbering, although it had met to Labienus, could not count on more than ten legions, very tired by the battles of Gergovia and Lutetia, which number should not exceed 45,000 units, with another 5,000 auxiliaries and few hundreds of Germanic mercenaries dismounted. The strong point of the Roman army was the legionary infantry even if the cavalry had its importance. In fact, for quantity and quality the gallic Knights were far superior to the Roman ones, but the latter had among their ranks the Germans, skilled horsemen whose Gauls had a sort "holy fear". Caesar, being aware of this, to limit the damages that could cause the enemy cavalry, dismounted even his tribunes to give a horse to the Germans. In conclusion, Caesar could count, before the battle of Alesia, on 48,000 infantrymen and 4,000 horsemen almost all Germanic. we must remember that the Roman armies had one Commander (dux), then several officers: the military tribunes, usually six per Legion, and the Centurions who were the true backbone of the Legion and were generally two per manipula. The legatus were figures that do not had a specific military rank but led separated units until the oncoming main army Commander. Caesar mentions, in his story about the siege of Alesia, the tribunes Marcus Antonius and Gaius Trebonius, responsible for the sectors most exposed to enemy attack, besides Caio Antistio Regino and Gaius Cornelius Rebilo defenders of Mount Rea. The number of the Gauls at Alesia we can figures it's unprecise. Before the Vercingetorix's pursuit to Caesar, the Gauls could count on 15,000 horsemen, 50,000 infantry, of which 6,000 killed in the clash and other knights fell before retiring in Alesia or while calling reinforcements. Before the siege to Alesia were present approximately 45,000 infantrymen and only a few hundred Knights. What really scares is the size of the army outside the cisty of Alesia: according to the estimates of the "De bello gallico" 240,000 gallic men were present, of which about 8,000 were knights, a figure so enormous as credible, considering that the Gauls in the choice of this army had not done a mass gathering but were limited to take a contingent from every nation of Gaul. Almost certainly, among this 240,000 gauls, only 60,000 were well equipped or had the right age. Unlike the Romans, Gauls had several commanders. There were four "principles": Commius of the Atrebates, Viridomaro and Eporedorige of the Aedui, Vercasivellauno of Arverni (a cousin of Vercingetorix). Among all those, at Alesia distinguished themselves the same Vercingetorix and Critognato that, like his barbarians fellows, proposed even cannibalism as to continue the defense of the city. 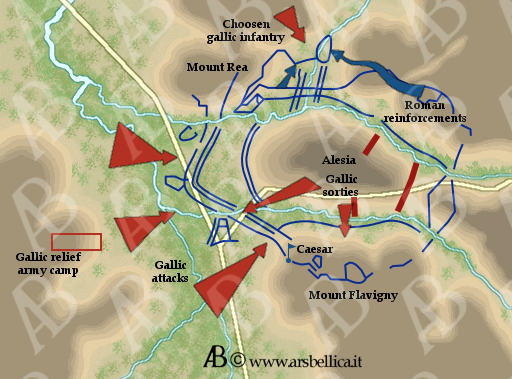 The Gallic Cavalry stationed inside Alesia attempts a surprising attack, rejected and decimated by the Romans who force them to return inside the city walls. Meanwhile the mandubii citizens within Alesia were chased away by Vercingetorix and left to their fate. Rejected by Caesar die of starvation in the land halfway between Romans and Gauls. In addiction, Caesar had stolen all the horses of the Gallic Knights died during the attack in order to give them to "its" Germans. The next day, Vercingetorix ordered a simultaneous attack of the troops inside Alesia and the chivalries relief army outside the city, the target were three Roman camps on the plain. Surprisingly even Roman knights get out the fortifications to fight and at first were forced to recoil; but the intervention of the German Cavalry, break through left, completely overturn the fortunes of this clash by sending en route the Gallic horsemen and, at the other side, the infantrymen of Vercingetorix were forced to retreat into the city once again. 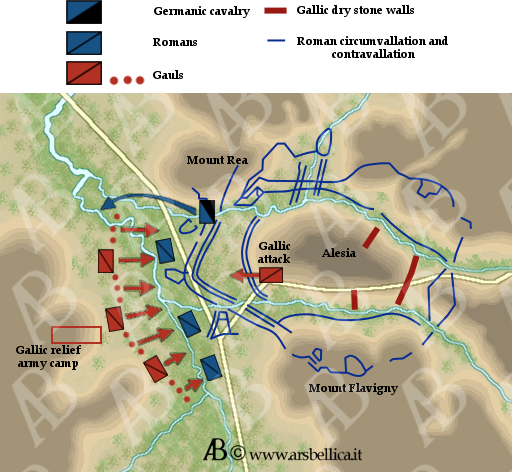 During the night following the first clash between the two sides, the Gallic infantry, both inside and outside of Alesia, assaulted the Roman camp. The losses were many on both sides but again the Gauls retreated while the Romans, exhausted, resists. After almost fifty days of siege, the Gauls commanders decided to attack the Roman camp of Mount Rea; the farther from Alesia but even the most awkward to defend given the conformation of the territory and given the poor visibility. The surprise factor had play a very important role; so, for this operation, were chosen 60,000 among the bravest Gallic fighters under the command of Vercasivellauno. After 7 hours of marching and 5 of rest, were finally ready to attack. Meanwhile, in the plain below, all Knights come out of tents and all infantrymen by bivouacs going to stand in front of the western perimeter of the fortifications. Even the exhausted remaining Gauls of Alesia come under Vercingetorix to launch the final assault. The Gauls launched a devastating charge, but having now understood the shape of Roman traps, this time he bringed mats and bundles to cover them or otherwise make them harmless, exceeding even the embankments leading to impact with the legionaries in a bloody hand-to-hand fighting. The tribunes requesting reinforcements from all parts of the camp, attacked from both inside and outside, while hear to Caesar that the Gauls have break through in Mount Rea. 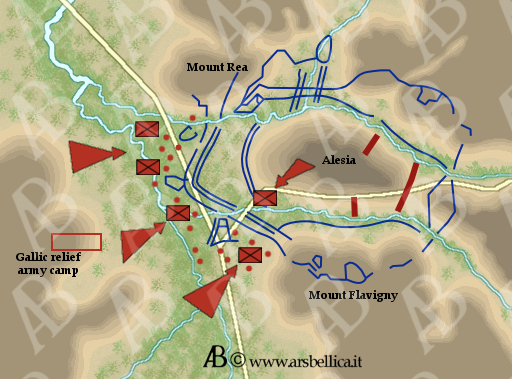 Labienus is sent there with 6 cohorts with orders to resist and, if possible, try a sortie; but the number and the violence of the enemy charges induce Caesar to remove troops from Flavigny mount, which according to the Romans was uncatchable, to reinforce other areas that had more pressure. Vercingetorix captured soon the move of his rival and so gave ladders to his warriors as to assault the same mount. Caesar was so forced to send troops again at Flavigny to stem this new enemy attack, but nor Caio Fabio nor Decimus Brutus were good enough to manage this situation, so he had to intervene personally as to restore the situation. At three in the afternoon there is a situation of balance on the plain and at mount Flavigny but remains a great danger on Mount Rea. Caesar then goes to Mount Rea collecting 4 cohorts and as many knights as possible; to the latter he asked to make a highly risky maneuver: to travel around the entire perimeter of the fortifications at North and, from there, attacking from behind the 60,000 Gauls of Vercasivellauno. In doing so, however, Caesar risked a lot because he deprived himself of the latest mobile reserves (the Knights) to carry out a manoeuvre that would last two hours at minumum, even considering a fast-paced action of the Knights. Meanwhile, to resist, Labienus had recalled to himself 33 cohorts (nearly three out of ten legions available from start) and the help of Caesar. When he arrived, the Roman Commander became aware of the situation: the Roman and Gallic lines were so mixed that wasn't possible to thrown a Javelin without risking hitting their own companion. The legions were in great distress, but finally, as expected from Caesar, the Roman cavalry arrived in time to slaughter the Gauls and restore order on Mount Rea. "Nostri, omissis pilis, gladiis rem gerunt. Repente post tergum equitatus cernitur. Cohortes aliae adpropinquabant: hostes terga vertunt. Fugientibus equites occurrunt. Fit magna caedes"
("Ours, renouncing javelins and held the gladii. Suddenly appears behind (of the enemy) our Cavalry. The other cohorts are pressuring, enemies extend their backs. The riders chasing the fugitives. There is a great slaughter "). With this move it wasn't destroyed a huge part of the enemy army but the retreat of those 60,000, had increased the fear in the remaining Gauls who fled in panic. After nearly 50 days of attacks the Gauls had never break through and had played their final card. The revolt is finally over and once again Rome won! Caesar had defeated the Gauls in just 7 months, while his opponent, Vercingetorix, according to some sources, was brought to Rome as a war trophy and paraded during the triumph that celebrated the Roman General victory over the Gauls. From what we know, at the end of the ceremony was strangling at the foot of the Capitol. With the fall of Alesia, Caesar had finally defeated Vercingetorix and almost completely closed the submission of Celtic people that will become final when, after one year, Caesar will make of the entire Gaul a Roman province. This victory may have several implications, in fact the Romans thanks to this victory and the following conquest of Britannia (England), move the "Center" of the Empire by the Atlantic and Mediterranean to the North Sea. But not only that, the fusion of Celtic peoples with the Latin ones (with the addition of the Germanic invaders of 5th century BC) and the merger of their customs and cultures, will be the basis for the Romance cultures of Provence, the courtly poetry and the Carolingian cycle poems. Alongside the rising of a new culture, onother one was shutting down, the Celts, an ancient and flourishing civilization that lingered for a long time only in distant and beautiful island of Ireland. This phrase is not a simple Latin definition but an adjustment of policy adopted by Rome. The Romans, in fact, while conquering peoples were very generous, but only if those peoples recognized the authority of Rome; on the contrary they were very harsh and ruthless with those who, even conquered, look for independence. Caesar followed this Roman policy at Alesia when unarmed citizens of the same city will ask to pass through the fortified Roman camp and Commander of the legions will deny this permission. This move may seem cruel, but is the demonstration of how Caesar can't conceive any rights to the barbarians enemies of Rome. On the other hand we have to imagine that an attitude that can be defined as "charitable" from the Romans would certainly not intimidated opponents, indeed, were the same Gauls rebels that first decided not to help the people of Alesia and left to starve. Caesar then, at Alesia, apply the formula parcere subiectis, debellare superbos verbatim in a difficult situationthat will demonstrate all his steely character. The double wall builted by the Romans at Alesia had no historical precedent, not even for the Romans. It was a unique defensive system devised in short time and for the first time since Rome had begun its expansion that still remain today. We were referring the fact that for the Romans a type of fortification of this genre is a "first time". In fact, the Roman army did not have a full-fledged military genius, but had the legions fabrum cohortes, able to work the metal but especially able in erect buildings as encampments, fortifications and roads, any other work required in a military campaign. Caesar himself, to intimidate the Germanic peoples, "used" the construction of a bridge over the Rhine in a few days (in 55 BC) who was an extraordinay example, if we consider the era, of military engineering and efficiency of manufacturers that the Roman leader had under his control. A Roman defeat at Alesia would result a change in the history of the Roman Empire. First of all, the loss of ten legions at Alesia was a serious flaw in the Roman military power, but the problems to "our" would not be concluded here. The rise and Caesar's career would abruptly stop and the province would be dissolved soon. All this would go in favor of the Gauls that, no longer under the direct pressure of the Roman legions, could attempt a difficult Alliance in Spain, where the Celtic tribe (the celtiberians) was still numerically important. This move would have truncated the Roman trade with the Iberian Peninsula, causing serious damage to the economy of Rome but once again recreating the situation that was formed during the Punic Wars, two super powers, Gaul and Rome, fighting for control of the Western Mediterranean. From this point, can start the even more imaginative game of alliances that could form after the defeat at Alesia. On one hand the Romans would have tried to form an alliance with the Germans (even if relations between the two populations were certainly not good), while the Gauls would have attempted the Alliance with the distant but still powerful, Egyptians and Parthian Empire against the Roman Empire. Hence perhaps the single biggest favorite would be the Egypt that had no enemies at the gates and otherwise would have strong allies.